The Rapid Visco Analyser is a unmatched tool for product development, quality control and process control. The RVA is a cooking, stirring viscometer with ramped temperature and changeable shear capability perfected for testing the viscous properties of starch, grain, flour and foods. The analyzer requires as little as two or three grams of sample using international standardised methods or your own tailor-made test routines of mixing, measuring, heating and cooling. Applications include: flour and grain quality, native starches, modified starches and starchy samples, formulated foods (e.g. sauce, ketchup, gravy, dressing, mayonnaise, soup, dairy beverages) other ingredients and foods (e.g. hydrocolloids & proteins), cooked and extruded foods (e.g. ready to eat breakfast cereals, snack foods, pet foods, fish feeds and animal feeds), meltability tests (e.g. process cheese, chocolate and confectionery) and “Miniature Pilot Plant” small scale process emulation. 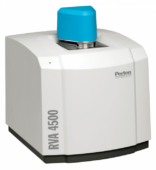 The RVA 4500 and RVA-TecMaster combine speed, precision, flexibility and automation with Thermocline for Windows (TCW) software for viscometric data acquisition and analysis on a local machine. The RVA-StarchMaster2 offers the same speed and precision with simple stand alone operation. The RVA-StarchMaster2 is recommended for routine testing, process and quality control. Made of aluminium (Al 1070 alloy), suitable for most applications at near neutral pH up to 100°C. Also suitable for use with organic solvents such as dimethylsulphoxide (DMSO). Coating with a cathodic epoxy to make them chemically resistant to pH (2-11) and are suitable for use for the most severe chemical conditions up to 100°C. The coating narrows the shearing gap between the paddle tip and the canister, which has a minor effect on viscosity results. Using the same cans between tests will ensure consistency in comparisons. Recommended single use only. Used with the RVA 4800, for most applications at near neutral pH up to 140°C, including those involving the use of organic solvents such as DMSO. Coated with cathodic epoxy. Used with the RVA 4800 in extreme pH conditions (2-11) up to 140°C. Recommended single use only. Made of (clear) polycarbonate and are suitable for most applications at near neutral pH up to 100°C. Made from black polyphenylene ether (PPE) and exhibit excellent heat (up to 140°C) and chemical resistance. They are therefore suitable for use for the most severe chemical conditions. Recommended single use only. Made from polyphenylene ether (PPE), suitable for use on the RVA 4800 with HT standard and chemical resistant cans. When c with the HT chemical resistant cans, are suitable for the most severe test conditions. On the variable shear gap paddle, the paddle length can be altered, allowing the clearance between the bottom of the paddle blade and base of the canister to be adjusted, providing altered shear characteristics for R&D purposes. Made of polycarbonate, suitable for low temperature use only. 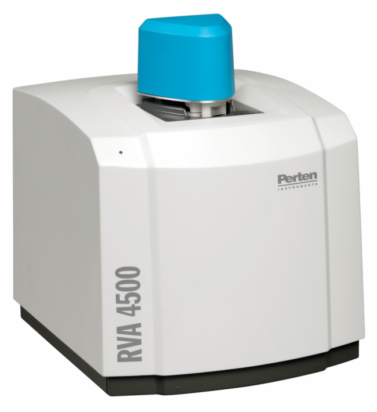 Allows the measurement of high viscosity, homogeneous fluids with viscosities in the range of 1000-120,000 cP (80 rpm). The paddle head is machined from modified Nylon ‘Delrin’, the blades and shaft are stainless steel. Paddle blades can be washed and re-used. These paddles are suitable for low temperature use only. Specially modified standard paddle and syringe which allow low viscosity fluids to be injected into test material in the canister during a test on the RVA. A flushing procedure has been developed to clean the tube and prevent blockages. These paddles are suitable for low temperature use only. Native and modified starches of grains, roots, tubers and others. Process cheese manufacture and meltability, effect of drying temperature on milk protein powders, rennet caseinate rehydration, dairy beverages, custard, age thickening of sweetened condensed milk and “Miniature Pilot Plant” small scale manufacture of yoghurt, ice cream mix and dairy desserts.